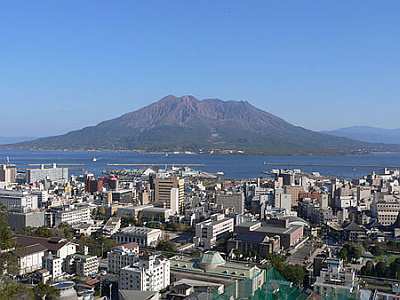 Kagoshima ,is a city of some 600,000 at the southwestern tip of the Kyūshū island of Japan. Even before the age of Sister Cities, Kagoshima had been known as the “Naples of the Orient,” due to climate (warm), location (a port city), temperament of the inhabitants (friendly but I don’t know if they park on the sidewalks; I suspect they do not) and the nearby presence of one of the world's most famous active volcanoes, Mt. Sakurajima, towering majestically over the city across Kagoshima Bay. The volcano is 1,117 meters (3,665 ft), approximately like Vesuvius. Sakurajima erupts —or at least sputters— constantly and last erupted massively in 1914, an explosion so powerful that the lava flow filled in the 500-meter stretch of water (at an average depth of about 60 meters) to the south-east of the then island (! )-volcano and joined Sakurajima to the mainland.